Dr. Bancroft is an Associate Professor of Radiology, Dr. Berquist is a Professor of Radiology, and Dr. Peterson is an Assistant Professor of Radiology, Mayo Clinic, Jacksonville, FL. Dr. Kransdorf is a Professor of Radiology, Department of Radiologic Pathology, Armed Forces Institute of Pathology, Walter Reed Army Medical Center, Washington, DC. 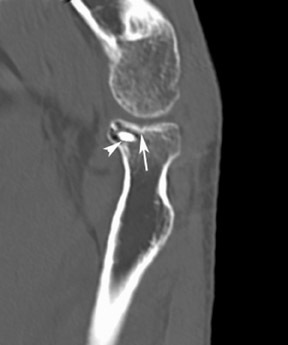 The evaluation of elbow pathology continues to advance, in part because of improved diagnostic imaging techniques. These improvements have assisted the radiologist in providing more accurate diagnoses and, therefore, better patient care. A variety of imaging modalities may be used for the evaluation of the elbow, depending on the indication and suspected disease process. 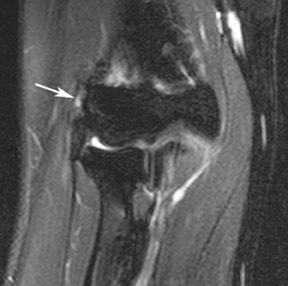 This article will provide an overview of the imaging characteristics of some disease processes that can affect the elbow, such as trauma, arthropathy, and infection. 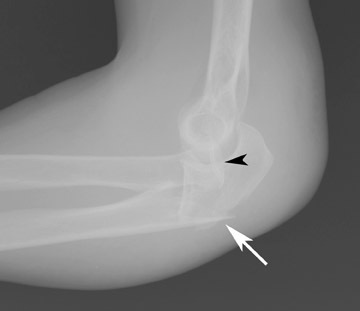 Most evaluations of the elbow begin with radiographs because of their screening value and relatively low cost. Lateral and anteroposterior (AP) radiographs are essential in the basic evaluation of disease. Oblique radiographs or additional views, such as the radial head view, may be utilized for further evaluation of occult trauma or early arthropathy. 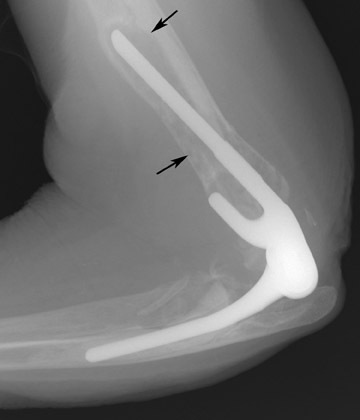 Elbow arthrography-either conventional, or followed by CT or MRI-is helpful in diagnosing capsular and ligament tears, osteochondral lesions, and loose bodies when there is no joint effusion. 4,9-12 The elbow can be injected laterally (radiocapitellar joint) or posteriorly with 8 to 12 mL of solution. Using a 50% diluted iodinated contrast solution for CT arthrography should not obscure small loose bodies. A 1:250 diluted gadolinium solution that contains 50% lidocaine/bupivacaine and 50% iodinated contrast can be used for MR arthrography. Following injection, T1-weighted (T1W) fat-suppressed images are obtained in the axial, coronal, and sagittal planes. In addition, a fast spin-echo (FSE) T2-weighted (T2W) fat-suppressed (FS) sequence is obtained for the detection of marrow abnormalities, soft tissue lesions, or fluid collections. Sonography is useful in evaluating a variety of structures, such as the common extensor and flexor origins, collateral ligaments, nerves, and bursae. 13-17 Medium- (7.5 MHz) or high-frequency (12 MHz) linear array transducers can provide high-resolution images of the periarticular soft tissues. 14,17 In experienced hands, this modality has been proven to be quite accurate. 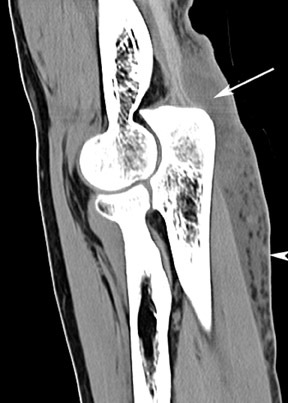 Nuclear medicine imaging is occasionally used for imaging elbow pathology. Bone scintigraphy with technetium-99m methylene diphosphonate ( 99m Tc-MDP) is helpful to identify areas of active bony turnover and reparative processes. Combined 99m Tc-MDP and indium-111 111 In)-labeled leukocyte scans can be useful in the detection of infection, and fluorine-18-fluordeoxyglucose (FDG) positron emission tomography (PET) imaging can identify foci of hypermetabolic activity in cases of tumor, inflammation, and infection. Elbow fractures and other injuries are common in infants, children, adolescents, and adult throwing athletes. 6,18-22 Routine radiographs and CT are generally sufficient for the detection and classification of skeletal injuries. 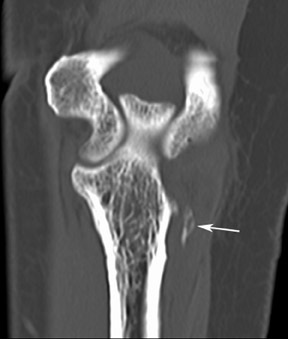 However, it is not uncommon to detect occult skeletal injuries with MRI that were overlooked or were not identifiable with conventional techniques. 3 In children, supracondylar humeral fractures account for 50% to 60% of all fractures and have high complication rates. 22 Physeal fractures are also common in children and adolescents, with the majority of injuries occurring between 4 and 8 years of age, when epiphyses are not well ossified. 22-24 Fractures of the lateral condyle are most common, accounting for >54% of fractures. 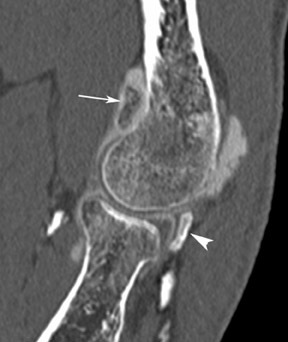 23 "Little leaguer's elbow" typically occurs in 9- to 12-year-old baseball pitchers, and represents avulsion and fragmentation of the medial humeral epicondyle due to repeated valgus stress from the flexor and pronator muscles across the growth plate. 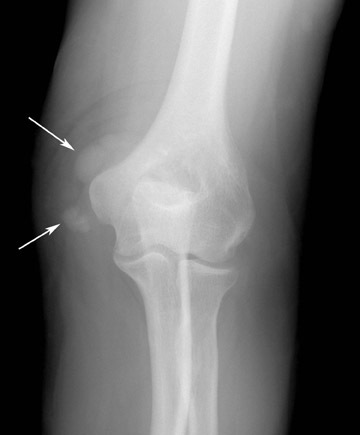 The radial head fracture is the most common elbow fracture in adults. Trauma evaluation should begin with radiographs (Figure 1) but may be supplemented with CT or MRI. Imaging features that affect patient prognosis include the degree of comminution, angulation, and depression of the radial head fracture. 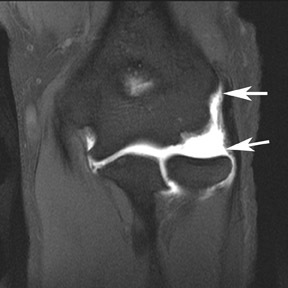 CT may be useful in evaluating the articular congruity of the radial head, especially after reduction (Figure 2). 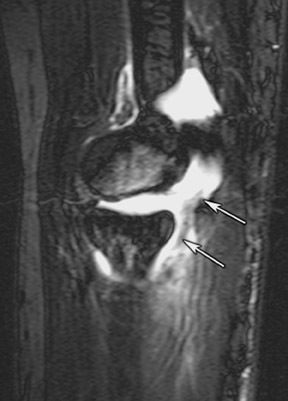 MRI is very sensitive for the detection of occult fractures (Figure 3), either in the marrow or physis. 23 Marrow edema or bone contusions are low in signal intensity on T1W images. Fractures are evident as hypointense lines within the marrow if there is trabecular compression and discontinuity of hypointense cortical bone. Radial head fractures can be classified by the Mason Johnston classification system. 25 Type I include nondisplaced fractures. Type II are minimally displaced fractures with depression, angulation, and impaction. Type III fractures are fractures that are comminuted and displaced. 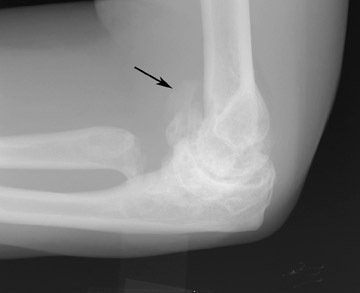 The most severe, Type IV, are radial head fractures that are associated with dislocation of the elbow. In cases of extensive comminution of the radial head, radial head resection is usually performed, allowing for resumption of pronation and supination. Occasionally, radial head prostheses are placed in the attempt to gain function. However, these implants are prone to fracture, may dislodge, or may cause synovitis (Figure 4). The capitellum is less commonly injured than the radial head. 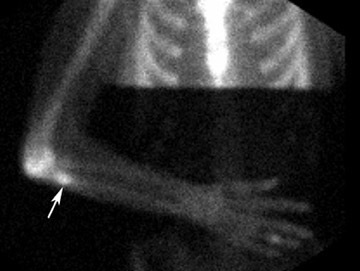 Fractures often occur from valgus force, with impaction of the radial head against the capitellum (Figure 5). 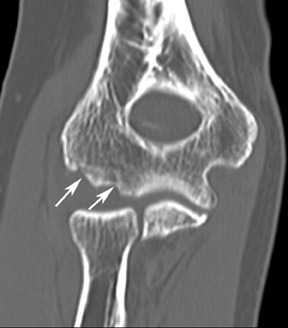 One known imaging pitfall is the pseudodefect at the junction of the capitellum and lateral epicondyle, which is actually a normal osseous groove. 26 The pseudodefect deepens as images proceed more laterally, and occasionally 1 or more fine, low-signal lines extend from the pseudodefect into the marrow. In adults, dislocations of the elbow are second only to those of the shoulder in frequency. 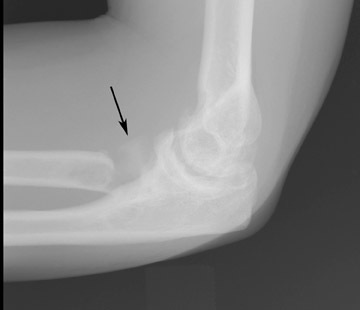 In children, it is the most common dislocation. Simple posterior elbow dislocations usually result in complete disruption of all of the capsuloligamentous structures, with variable adjacent muscular injury. 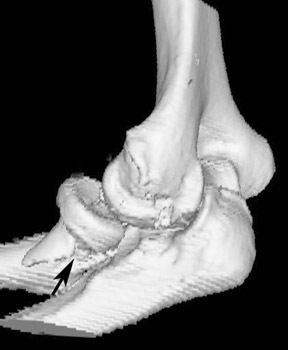 27 Persistent instability after closed reduction of a simple dislocation may be secondary to soft tissue interposition or entrapment of an intra-articular chondral or osteochondral fragment. 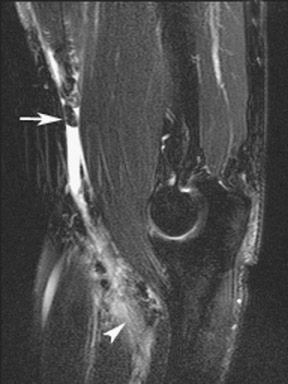 27 MRI and MR arthrography may assist in diagnosis in these circumstances. 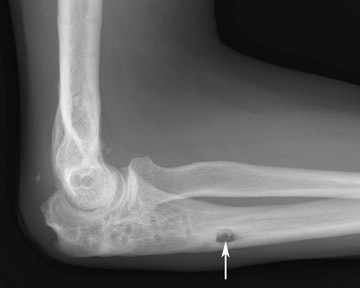 Fracture-dislocations take various forms in the elbow and forearm. The Monteggia fracture-dislocation is composed of a fracture of the proximal ulnar and a dislocation of the radial head (Figure 6). Care must be taken not to overlook subtle subluxations or nondisplaced fractures with this injury pattern. Additional support for the elbow is provided by the radial and ulnar collateral ligament complexes. 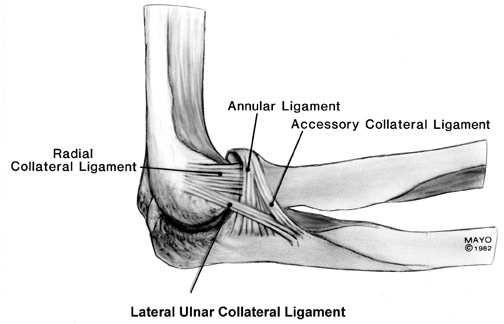 22 The radial (lateral) collateral ligament (RCL) complex is composed of the lateral ulnar collateral ligament, RCL proper, and the annular ligament (Figure 12). 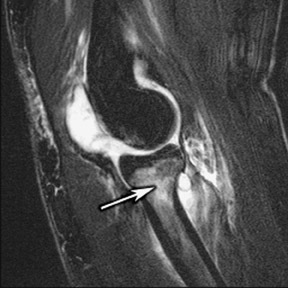 37 Injury to the RCL complex (Figure 13) is less common than medial ligament injury and is usually the result of varus stress or subluxation/ dislocation. Overly aggressive surgical procedures, such as common extensor tendon release or radial head resection, can also lead to radial collateral ligament injury. 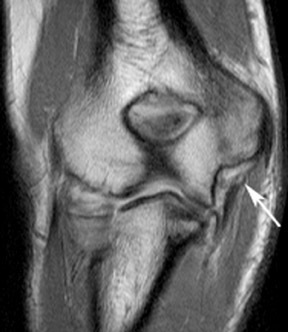 24 The lateral ulnar collateral ligament is the primary stabilizer against varus stress, and its disruption (Figure 14) can lead to posterolateral rotatory instability of the elbow. 19,38 The radial collateral ligament proper attaches to the annular ligament; therefore, both structures should be evaluated critically. Multiple other arthropathies can affect the elbow, some of which have characteristic features. Gout may also involve the elbow (Figure 18). 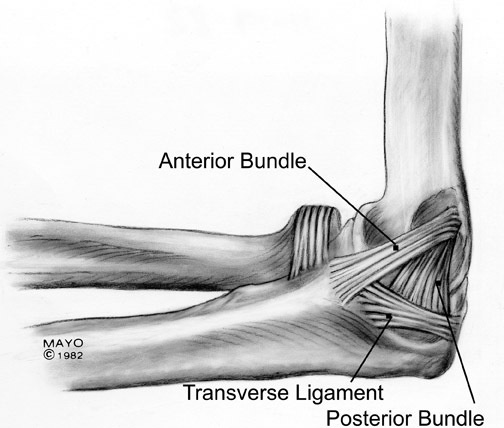 The olecranon bursa is more commonly involved than the joint. Fluid in the bursa may be due to bursitis, but gout should always be considered. 4 When the elbow is affected by rheumatoid arthritis, the wrist and hand are invariably involved. 27 MRI provides a method for early detection of synovial inflammation and bone erosions (Figure 19). Response to therapy (active synovial inflammation and new erosions) can also be monitored with contrast-enhanced MR imaging. MR imaging may be required to make a definitive diagnosis of infection. 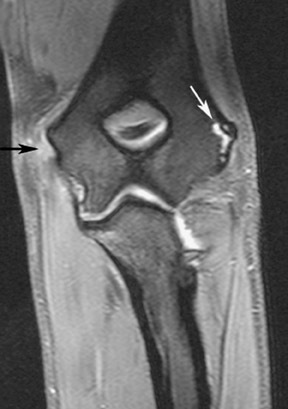 Generally, a combination of T1W, STIR, or FSE T2W fat-sup-pressed, and enhanced T1W fat-suppressed images is the most sensitive technique for the detection of osteomyelitis. Osteomyelitis is characterized by an area of prolonged T1 and T2 relaxation times and marrow en-hancement. Changes in cortical bone (osteitis), periosteum (periostitis), and muscle are often less obvious. The presence of associated cortical destruction, sinus tracts, low-intensity sequestra, cloaca, and adjacent soft tissue inflammatory signal changes can also be evaluated with MR. 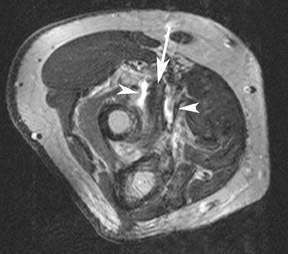 In this article, the imaging characteristics of a variety of disease processes involving the elbow have been presented. There are distinct advantages of each of the different imaging modalities: radiography, sonography, scintigraphy, arthrography, CT, and MRI. The choice of imaging technique will depend on the suspected disease process, the availability of advanced imaging (such as MDCT and MRI), and the personal preference of the radiologist. The ultimate goal is to provide the most accurate diagnosis for each patient, which allows for the best patient care. 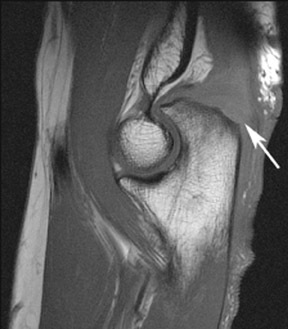 Imaging of elbow pathology. Appl Radiol.